Looking for the perfect holiday gift? Want to get all of your shopping done during your coffee break or lunch hour? Join us for the Ultimate Coffee Break, with free samples of coffee and Virginia's Finest products, hosted by the Virginia Shop and Great Foods to Go—the Library's new cafe. On December 10 from 10:00 am until 2:00 pm the Virginia Shop will feature discounts of 50-75 percent on books and other inventory clearance merchandise. Members and state employees receive a 10 percent discount on non-sale items, featuring Virginia's Finest products from chutneys to cheese straws, limited edition Miller & Rhoads Santas, and much more. Free food samples and great deals on everything from books to framed prints—what more could you ask for? For more information call the Virginia Shop at 804-692-3524. 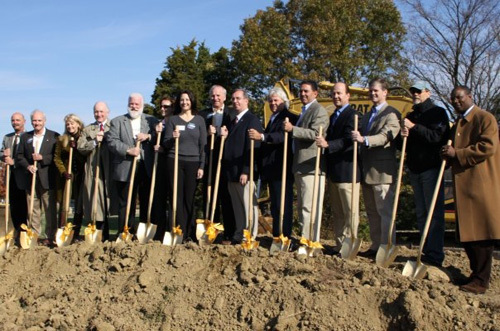 Library of Virginia Board members Marc Leepson and Christopher Clarke participated in the long-awaited groundbreaking for the Gum Spring Library in Loudoun County on November 7. Located in the Stone Ridge community, the new library is expected to open late in 2011 and will be the county’s first two-story facility. It will occupy two floors of the four-story building encompassing 40,000 square feet. Stone Ridge Community Development, LLC, is dedicating the space to the county. Officials cite the library as a prime example of a private/public partnership that benefits the county and the community. The addition of the library will immediately add 160,000 books to the Loudoun County Public Library System. At its November meeting the Virginia Sesquicentennial of the American Civil War Commission approved a grant of $262,226 to the Library of Virginia for a digital legacy project that will scan privately held Civil War manuscripts such as letters and diaries. Lyndon H. Hart III, director of the Library’s Description Services branch, cautioned commission members that the 150th commemoration may be the last opportunity to find and preserve this information. Teams from the Library of Virginia have visited Danville and Winchester to evaluate and scan family records containing original manuscripts from the Civil War. Response was overwhelming at both locations. Eventually, the Library’s work will be available for viewing on the Library of Virginia Web site and on local historical and museum sites. On January 4, 2010, the Library of Virginia will open a new exhibition, Children’s Home Society of Virginia: Every Child Deserves a Home, in its café corner. The exhibition highlights the 2008 donation of the business records of Children’s Home Society of Virginia to the Library of Virginia. In 1900, distressed over the numbers of children being abandoned in streets and alleys, a group of citizens established Children’s Home Society of Virginia. All across the state, children were in need of clothing, food, and safe shelter. Appalled at the conditions and care offered in orphanages, these men and women banded together to offer children more secure futures. During the early years, children were brought to a receiving home in Richmond pending placement with a suitable adoptive family. 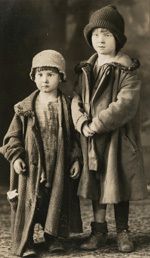 By 1930, Children’s Home Society of Virginia was part of the national trend of placing children in individual foster homes rather than in orphanages. By 1960, there were more than twice as many children in foster care as in institutions. Twenty years later, the foster child population exceeded 500,000, roughly where it stands today. The need for “forever homes” grows more critical every day. In Virginia, more children "age out" of foster care than in any other state. More than 20 percent will turn 18 without ever having been adopted. And without the support of a loving family, many will struggle. According to the Pew Charitable Trusts, one in four will end up in jail within four years of leaving foster care, one in five will be homeless, and fewer than one in six will earn a high school degree. The goal of Children’s Home Society of Virginia is to find permanent homes for all needy children in the state and to provide services to birth families, adoptive families, and adoptees. Since 1900, the nonprofit agency has placed more than 12,500 children into adoptive homes. The agency’s signature program, Partnership for Adoptions, established in 1998, focuses on finding permanent homes for older children in the custody of local departments of social services. All case files remain in the custody of CHSVA. To learn more about Children’s Home Society of Virginia, visit online, www.chsva.org. The exhibition will remain on view through Saturday, May 1, 2010. When NASA’s space shuttle Atlantis (STS-129 mission) returned Thanksgiving Day from its 11-day voyage to the International Space Station, it had on board a special keepsake from the Library of Virginia. The Library created facsimile copies of the title page and frontispiece illustration of a rare astronomy book from its collections. 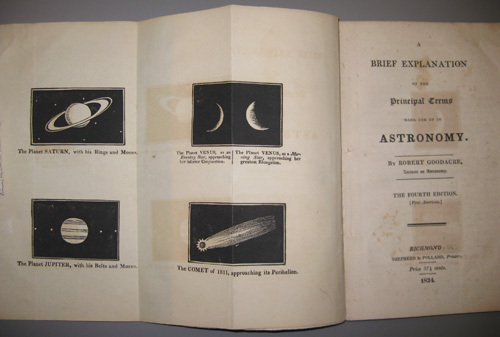 This title, A Brief Explanation of the Principal Terms made use of in Astronomy by Robert Goodacre, is one of only four recorded copies in the world. The first American edition, printed in Richmond in 1824, is a 54-page dictionary of terms intended by the author “to be found useful to the lover of Astronomical Science.” Goodacre, a lecturer in astronomy, cautioned that although some the terms were peculiar, they were necessary given the unique nature of astronomy among the sciences. The Library of Virginia was offered the opportunity to send this sample of Goodacre’s work into space by Virginia native and astronaut Leland Melvin, selected as one of the Library of Virginia’s 2009 African American Trailblazer honorees. In February 2009 he conducted a special program, “From Lynchburg to Launch Pad” for K–12 students at the Library. As a former co-manager of NASA's Educator Astronaut Program, Melvin has traveled across the country, engaging thousands of students and teachers in the excitement of space exploration, and inspiring them to pursue careers in science, technology, engineering, and mathematics. He believes in the power of teamwork and education and shares the Library’s goal of encouraging learning. The Library of Virginia was honored by Melvin's willingness to recognize the Library in this special way and will use this “space” copy in educational programming, tours, and public viewing. The Library plans to host an event marking the return of this well-traveled facsimile to the collection and to honor Melvin’s ongoing contributions to the Library of Virginia. Like so many of us, the Library of Virginia is charged with doing more with less in these difficult economic times. Our budget to purchase books has been reduced 84 percent in the last year alone. Funding to conserve and restore our treasured collections has all but vanished. While we weather these times with determination to continue our current levels of service, the Library relies more than ever on the Library of Virginia Foundation to try to make up the difference in funding these basic needs. In the coming year, the Foundation has challenged itself to double the amount of support provided for acquisition and conservation efforts in the coming year. Additional funds raised will go directly toward purchasing valuable volumes that would otherwise be missing from our shelves and to conserve books and items from the state archives that would continue to deteriorate without attention. Please consider becoming a member or renewing your membership in the Semper Virginia Society, the Library’s membership circle. The benefits are many and the impact is huge. For more information and to become a member, please visit www.lva.virginia.gov/involved/semper.asp or call 804-692-3813. Your support will make a difference. Raising his glass at a July 4th celebration in 1852, a young Irish-American resident of Richmond toasted "the land we live in; not forgetting the land we left." The sentiment reflects the history of more than four centuries of Virginia immigrants, who nurtured traditions from their homelands even as they contributed to the local economy and culture. Their stories come alive in a new exhibition opening January 11, 2010. The exhibition continues through August 28, 2010.
Who is a Virginian? Anyone who lives within the state’s borders? Someone who was born here? Do working and paying taxes here make you a Virginian? Or is it something more complicated, having to do with how you feel about the state? The Land We Live In, the Land We Left: Virginia’s People explores the lives of immigrants from a wide variety of homelands who settled in every part of the state. Some, like the Henkels of New Market, have well-known stories that have long been interwoven with the history of the state. Others, like the Rosenstocks of Petersburg, left behind detailed records and family photographs. Still others, such as the Campas family of Norfolk, were unknown until their stories were pieced together by the Library’s own history detectives. The exhibition not only illustrates the history of immigration, but also reflects the personal sense of rupture, loss, and sacrifice that many immigrants shared. The state's efforts to control the flow of immigration—recruiting certain groups of immigrants while discouraging others—will provide a common thread among the stories. The 2010 federal census and current debates over the treatment of illegal immigrants in the state and the nation make this a timely exhibition. Virginia has always been home to a diverse array of nationalities, races, and ethnicities. The Land We Live In, the Land We Left: Virginia’s People will underscore the diverse population in Virginia at the time of colonization and the waves and troughs of immigration to and emigration from the Old Dominion. Lisa Goff, an intern at the Library from the University of Virginia’s Institute for Public History, is guest curator for this fascinating and timely exhibition. She is a doctoral candidate at the University of Virginia and holds a master’s degree in history from the University of Virginia, a master’s degree in journalism from the Medill School of Journalism at Northwestern University, and a bachelor’s degree in English literature from the College of William and Mary. The Land We Live In, the Land We Left: Virginia's People is sponsored by the Norfolk Southern Corporation. The exhibition is open to the public Monday through Saturday from 9 am to 5 pm. There is limited, free underground parking, which is accessible from either Eighth or Ninth streets, for those visiting the exhibition. The story of Virginia is, in many ways, the story of our nation. From the country's beginnings as an English colony to the creation of the United States of America, Virginia—its land and its leaders—has been central to the nation's formation. All of our founding documents—the Declaration of Independence, the United States Constitution, and the Bill of Rights—are derived, in part, from the thoughts and pens of influential Virginians. Other Virginians—women, American Indians, and African Americans—pushed out the edges of this newly formed democracy, contributing, protesting, and using the system to win the rights they desired. It is this remarkable legacy that the "Shaping the Constitution: Resources from the Library of Virginia and the Library of Congress" Web portal highlights. Launched in November by the Library of Virginia's Education and Outreach Services Division, “Shaping the Constitution” presents the multi layered and ongoing story of our nation's founding through the resources that the creators of our Constitution used and prepared themselves. Many of the sources are presented online for the first time on this portal. Using primary source documents, "Shaping the Constitution" explores the contributions of Virginians of all stripes to the forming and evolution of our nation. In addition to featuring high-quality digital images of some of the most significant documents in American history held by the Library of Virginia—including George Mason's draft of the Virginia Declaration of Rights, Virginia's copy of the Bill of Rights, and the Virginia Statute for Religious Freedom—the "Shaping the Constitution" Web portal includes transcriptions, biographical profiles of several Founding Virginians, contextual essays about the challenges the Founders faced, and lesson plans—all designed to serve as an educational resource for teachers and students who are exploring the beginnings of the U.S. government and Virginia’s connections to those events. Library staff member and historian Brent Tarter and John Kaminski, Constitutional scholar and director of the Center for the Study of the American Constitution at the University of Wisconsin-Madison, served as reviewers and writers for the project. In September 2008, the Library of Virginia received a matching grant totaling $30,000 from the Library of Congress’s Teaching with Primary Sources Eastern Regional Pilot Program for the project. The “Shaping the Constitution” Web portal provides the tools to access, explore, and incorporate these rare documents into classroom teaching and will serve the greater goal of making the educational community aware of the resources that are available from both the Library of Virginia and the Library of Congress. The first phase of the project, dealing with the Revolutionary War era, the drafting and ratification of the U. S. Constitution, and the development of the Bill of Rights, was launched in November 2009. The second phase, dealing with the 13th, 14th, 15th, and 19th Amendments to the Constitution, will go online in the spring of 2010.